Editor's note: Thanks to all the people who have contributed photos. 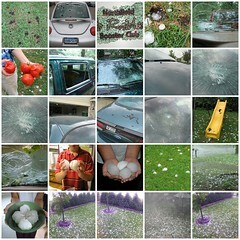 We have nearly 200 shots of the hail and hail damage from all over town in our Hail Storm Photo Gallery. There's more info in the comments below, and the St. Olaf College website also has a great story and photos. PLEASE, if you have photos, send them to pictures@northfield.org! We will place them in the gallery. If you have stories and comments, add them in the comments below. Channel 9 did a live broadcast featuring the destruction at Dokmo. The St. Olaf greenhouse was destroyed. Alex Beeby has a report on Northfield Ag damage. Phil Stoltzfus add the view from his windows. It hails on Ray Cox like everyone else. Benjamin Landsteiner at St. Olaf. It hailed in Wisconsin too. Submitted by Griff J Wigley on Thu, 08/24/2006 - 12:34pm. Submitted by ncoadmin on Thu, 08/24/2006 - 12:39pm. Submitted by adam.gurno on Thu, 08/24/2006 - 2:48pm. Submitted by ncoadmin on Thu, 08/24/2006 - 2:55pm. Submitted by ncoadmin on Thu, 08/24/2006 - 2:57pm. Submitted by Griff J Wigley on Thu, 08/24/2006 - 3:31pm. I snapped some photos at Dokmo's and blogged them here. Submitted by Benjamin Landsteiner on Thu, 08/24/2006 - 4:35pm. Some more photos can be found here. I got a few shots of the completely destroyed greenhouse at St. Olaf as well. All photos were taken on St. Olaf's campus. So much for my car . . . Submitted by ncoadmin on Thu, 08/24/2006 - 4:59pm. In any event - thanks for the comment. Submitted by Benjamin Landsteiner on Thu, 08/24/2006 - 5:13pm. True, but for consistency's sake, I preferred to use an alias, in the hopes that there would be additional fields within my account that would ask for my personal information. Alas, it was not there. Regardless, my name is Ben Landsteiner, a senior at St. Olaf (who also just happened to grow up in and around Northfield). Submitted by ncoadmin on Thu, 08/24/2006 - 9:15pm. Submitted by Alex Beeby on Thu, 08/24/2006 - 5:37pm. Gardens of Eagan in Farmington said they were on the edge of it and thinks they fared well. Fireside Orchards west of town said they had 1" hail and some crop loss and damage, but it could have been worse. Lorences Berry Farm just North of town said they had hail, but were pretty fortunate. They were out picking berries as I spoke to them. Thorn Crest in Dundas said things look good. Simple Harvest Farms in Nerstrand says it seems like they faired well. Open Hands Farm just North on Highway 3 say they have some damage but faired well over all. They lost their tomatoes, squash and some greens. Big Woods Farm in Nerstrand also said they seem to have dodged it with only quarter-sized hail. Everyone seems pretty positive but eye these coming storms with aprehension. Submitted by Corrie Erickson on Fri, 08/25/2006 - 4:37am. Here's a short, shaky video from the west side of downtown. Also, I am now the proud owner of a '93 Pontiac with about a thousand dents in it. The impact crater in the windshield is also a nice touch. Submitted by Griff J Wigley on Fri, 08/25/2006 - 10:31am. I've heard from people that they saw my name on WCCO-TV last night. Evidently, they showed a photo of my daughter with the hailstones and put my name underneath it. Here's the link to the photo that they must have used. Submitted by ncoadmin on Fri, 08/25/2006 - 12:05pm. Griff, it's confirmed, WCCO broadcasted both yours and my photos/videos. Submitted by Griff J Wigley on Fri, 08/25/2006 - 2:44pm. A buddy of mine supposedly tivo'd it, Chip. I'll let you know what I find out. Submitted by ncoadmin on Fri, 08/25/2006 - 3:08pm. Submitted by Griff J Wigley on Fri, 08/25/2006 - 2:51pm. 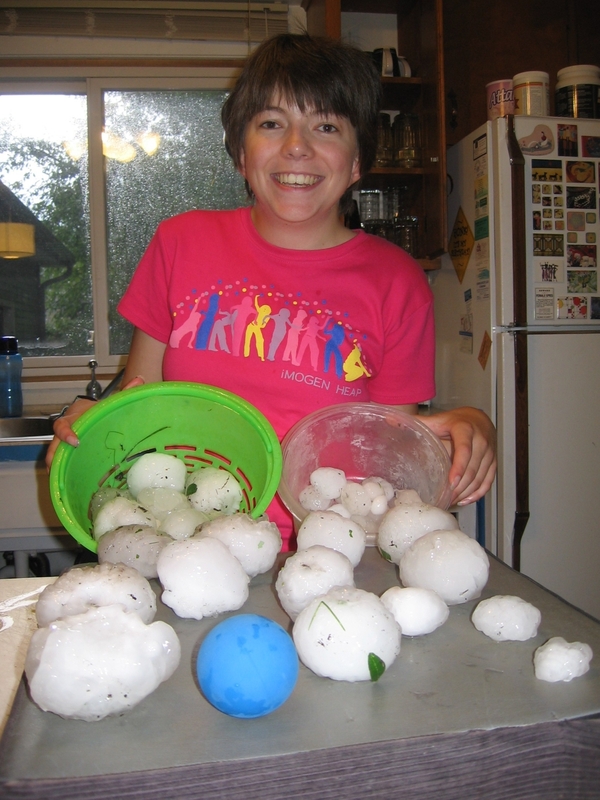 "Hail from the blogosphere: Northfield residents posted nearly 100 photos of hail and hail damage on a community website. Go to www.startribune.com/a1677"
that URL redirects to the N.org storm Flickr set. "With a quarter used as a scale, hail sits on a lawn at St. Olaf College in Northfield, Minn., Thursday. - Dan Iverson, Northfield News via Associated Press"